Did you miss me? Probably not. Did I miss you? Yeah, a little bit. I did, it is true. But I really did not miss blogging and I couldn’t seem to get anything read. I don’t know what is the most pathetic: a blog slowly dying with no new posts at all, a lot of unfinished challenges and an empty feeling to it all OR a reader not able to read at all. I have felt somewhat pathetic concerning my blogging and reading the past months – when I have had the time to think about it, that is. Because the reason I haven’t really been around has nothing to do with juicy personal problems or just boring personal problems. On the contrary. I have simply just been utterly and completely mega-swamped at work. Add to that my almost non-existant reading, and I could find no reason to blog at all, but I wish I had had the time to keep myself updated on what has been going on around the book blogger world. Have to make up for that now. All that said, I also have managed to read some books. So let me begin 2011 (although we are almost 2 months into this new year) with a short review of one of the last reads of last year, The Clearing by Tim Gautreaux. I remeber this book as a fine read, but not so fine that I am going to rush out finding the other books this author has written. 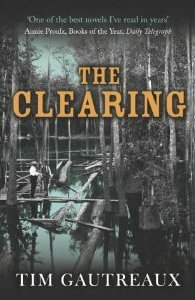 The Clearing takes place in the years after World War I in a small sawmill town in the middle of nowhere deep in the swamps of Louisiana. Byron, returning from Europe and the war as a broken man, is heir to a sawmill-empire, but decides to become a policeman in this small sawmill town instead of manager. Gambling, violence, drinking and genreal apathy is daily business out here in the swamps, and Byron has his plate full. He is far away from his younger brother and his father and their expectations, but trying to deal with rough sawmill workers and the Sicilian mafia (controlling bars, gambling and prostitutes) is also taking it’s toll. But he does his job and he tries to forget what he did and what he saw in Europe during the war. Hisu younger brother Randolp finds him, and he arrives to the sawmill town himself, setting up office as sawmill manager. Now begins a journey where the two brothers must begin to get to know each other again, not without certain trouble and hurting. It is especially the raw violence which Randolph sees unfolding weekend after weekend in the bar is a source of worry and fighting, because the brothers does not see eye to eye in how to handle it. Meanwhile the Sicilian mafia is getting closer, and the brothers are forced to make decisions which has dire consequences. This might sound like The Clearing is a romantic tale about two brothers finding each other after hard times, but if you think that, then it is my fault for not being able to describe this book good enough. It is a deeply serious novel, and there is nothing romantic about it at all (not that there is anything wrong with romantic novels). It is beautifully and tightly written in a brilliant language, the tone is serious all the way through and there is not really anything to laugh about. This is about how life unfolded itself in it’s most raw way about 100 years ago. Thus I can easily recommend this book, but it was too serious and too “deep” for me at the time I read it. This is of course not the book’s fault, especially since I often enjoy books with heavier themes. But it didn’t really work out for me at the time I read it. And speaking of e-books; do you know that you missed my launch of some of my flash fiction stories? I am not going to put any pressure on you – not the least bit – but I am sure it is cheaper than any Danish e-book you can get (excluding the free ones). I am sorry to hear that things have been so stressful! I hope they even out for you soon! I know the feeling–I've gone through periods where I haven't been reading much and had zero desire to blog, too. Don't worry, we still welcome you back! I missed you too! We all go through stages like that. I have found Twitter has renewed my love of my blog. As I told you on Twitter, of course you were missed!